5 star book review for realistic fiction book Juneteenth for Mazie by author and illustrator Floyd Cooper—OUT NOW! Once again, award-winning author and illustrator Floyd Cooper brings readers of all ages a magnificently beautiful story and brilliantly illustrated book about Juneteenth. Juneteenth for Mazie tells the history of Black/African-Americans to Mazie beginning with the day her great-great-great grandfather “Mose crossed into liberty” on June 19, 1865. 150 years ago, soldiers being led by Major General Gordon Granger arrived in Galveston, Texas to announce the end of slavery and the end of the Civil War. This was two and half years after the 16th President of the United Sates, President Abraham Lincoln’s Emancipation Proclamation which became official on January 1, 1863. Juneteenth is the celebration to commemorate these announcements. Mazie is told by her father the history of not only her family in the last 150 years, but of other Black/African-Americans. As the reader we are taken on a historical journey with warm and rich images. Through the story being told to Mazie, we experience key moments in the history of the United States of America. From the Selma to Montgomery march, using the iconic and a moving image of individuals walking across the Edmund Pettis Bridge to march of jobs, lobby for better schools and equal educational opportunities, and the right to vote as “they shouted for opportunity” to the inauguration of the first Black/African-American President of the United States, President Barack Obama, the 44th President. Mr. Cooper also entices of us with glorious images of history being passed down orally and how faith and spirituality plays a role in Black/African-Americans throughout time. We go through Black/African-Americans lives as slaves, to attempting to escape from freedom to today where we celebrate Juneteenth with foods like strawberry soda and barbecue that have become synonymous with the celebration. 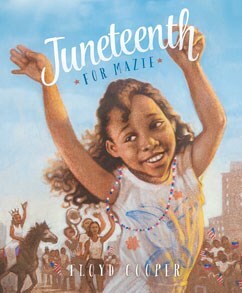 Juneteenth for Mazie by Floyd Cooper, three-time Coretta Scott King Honor Award winner and the illustrator for more than 90 children’s books is a must read and a book one should own.